Remember that Pinterest is all about people discovering things that inspire them. Reward quality over quantity. Make it easy to get involved with clear and simple instructions. Read our anti-spam measures to keep your contest fun and useful. Check out our branding guidelines if you’re going to reference Pinterest in any way. Suggest that Pinterest sponsors or endorses you or the contest. Require people to add Pins from a selection—let them add what they like. Make people Pin your contest rules. This is a biggie. Run a sweepstakes where each Pin, board, like or follow represents an entry. Encourage spammy behavior, such as asking participants to comment. Ask people to vote with Pins, boards, or likes. Overdo it: contests can get old fast. Require a minimum number of Pins. One is plenty. Call your contest a “Pin it to win it” contest. 3. Promotions may be administered on Pages or within apps on Facebook. Personal Timelines must not be used to administer promotions (ex: “share on your Timeline to enter” or “share on your friend's Timeline to get additional entries” is not permitted). Discourage the creation of multiple accountsIf users make lots of accounts in order to enter a contest more than once, they’re liable to get all of their accounts suspended. Please be sure to include a rule stating that anyone found to use multiple accounts to enter will be ineligible. Discourage posting the same Tweet repeatedlyPosting duplicate, or near duplicate, updates or links is a violation of the Twitter Rules and jeopardizes search quality. Please don’t set rules to encourage lots of duplicate updates (like saying, “whoever retweets this the most wins”). 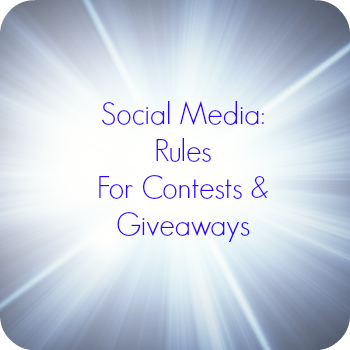 Your contest or sweepstakes could cause users to be automatically filtered out of Twitter search. Plus, instead of their followers seeing your cool contest or sweepstakes, their followers might start getting annoyed by your contest. You might want to set a clear contest rule stating that multiple entries in a single day will not be accepted. Ask users to include an @reply to you in their update so you can see all the entries When it comes to picking a winner, you’ll want to see all the contestants. If the updates include @username mention to you, you’ll be able to see all the updates in your Mentions timeline (see here for more information on replies and mentions). Just doing a public search may not show every single update, and some contestants may be filtered from search for quality. Encourage the use of topics relevant to the contestYou might decide to have users include relevant hashtag topics along with the updates (like #contest or #yourcompanyname). Keep in mind that hashtag topics need to be relevant to the update; encouraging users to add your hashtag to totally unrelated updates might cause them to violate the Twitter Rules. Follow The Twitter RulesWhile these guidelines should help keep your contest entrants in good standing, please make sure you also review both the Twitter Rules and our search best practices before starting your contest. If you’re a business on Twitter, you might also want to check out the Twitter 101 for Business guide for more information and tips. In addition, before starting any contests or sweepstakes please ensure that they comply with all applicable laws and regulations. Compliance with such laws and regulations is your responsibility; please consult with an attorney if you have questions about legal compliance. Hope these help when you plan your next giveaway!